Has America’s Arctic policy changed with the election of President Donald J. Trump? His November 2016 election came as a surprise to political pundits and mainstream media. The previous Administration of Barack Obama made climate change a cornerstone of U.S. Arctic policy. Obama’s Arctic policy was the subject of articles in the March and November 2016 issues of Canadian Sailings. It is an understatement that the new President has been less vigorous in his approach to climate science and the underlying causes of climate change. Whether this impacts U.S. Arctic policy remains to be seen: it is still very early days. President Trump has made it clear that he wants to make America great again and thicken the borders of continental America and this must also include the northern border along the coast of Alaska. These efforts will impact Canada. Most Americans don’t think of America as an Arctic nation but the state of Alaska, rich in natural resources, makes the U.S. an Arctic nation and will form part of the Administration’s attention to seek energy security and economic development. It should also not be forgotten that President Trump’s grandfather, Friedrich, originally a German immigrant, made his way to the Klondike Gold Rush from Seattle to Skagway, operating a series of hotels and bars in Canada’s Yukon’s. In his three years in Canada, Friedrich Trump opened the Arctic Restaurant and Hotel in two locations with a partner — first on Bennett Lake in northern B.C., and then moving it to Whitehorse, Yukon during the height of the gold rush. This is where the Trump family got its start in business and grandfather Trump amassed a small fortune in three short years before returning to New York. Canada’s Arctic gave the Trump family the start of a business empire. It is safe to say that the Arctic is very much part of the Trump family’s DNA and the region will be given a special place in this new Administration as Arctic issues develop and unfold in the next four years. It is clear from President Trump’s first thirty days in office that he is very much a hands-on President and wants to shake up the establishment in Washington. He wants to ensure America obtains the best value for the taxes it collects, and wants to ensure that American interests rank first. The Arctic remains an important geopolitical region with many American interests at play, and subject to continued international interest by Arctic and non-Arctic states such as China. Trump’s Secretary of State, Rex Tillerson, former Chairman of Exxon Mobil Corp., is no stranger to the Arctic region having been involved with Russian oil company Rosneft in a Joint Venture to develop offshore and onshore energy resources in Russia’s Arctic, whose reserves are conservatively estimated to contains 87 billion barrels of oil. However, development has been put on hold because of sanctions against Russia since 2014. While there is no guarantee of commercial production because of technical and commercial risks involved in Arctic offshore energy plays, it is clear that Secretary Tillerson brings a deep understanding of the risks and challenges involved in Arctic resource development to the highest levels of the United States government. Russia has invested heavily in Arctic infrastructure and resource development and has the world’s largest fleet of icebreakers. There are solid and experienced hands on the policy tiller at the U.S. State Department and also at the Department of Defence and Department of Homeland Security (under which the U.S. Coast Guard falls), which arguably will continue to build on solid work done by past Secretary of State John Kerry who had a particular interest in the region. While President Obama through Executive Order banned Arctic offshore drilling, there are still many energy issues at play in the region in the near coastal and land-based areas which potentially contain reservoirs holding massive volumes of hydrocarbon resources. In addition, receding sea ice has created the ability for more international shipping traffic to transit through the American exclusive economic zone (EEZ) which amplifies the need for increased critical infrastructure in support of shipping and marine domain awareness. A recent example of such need for capability was that of cruiseship Crystal Serenity traversing through U.S. Arctic waters last summer as well as Canada’s NW Passage. The voyage will be repeated this summer, with other increased cruise traffic and even a tall ship, the rebuilt sailing vessel Oliver Hazard Perry carrying American schoolkids on a journey through the NWP. The well-planned voyage of Crystal Serenity’s pioneering voyage was just the start of increased marine tourism in the region. It is unavoidable – and the United States will need an increased marine infrastructure capability which the Commandant of the U.S. Coast Guard has been calling for for years, including the urgent need for increased and modernized icebreaker capability. 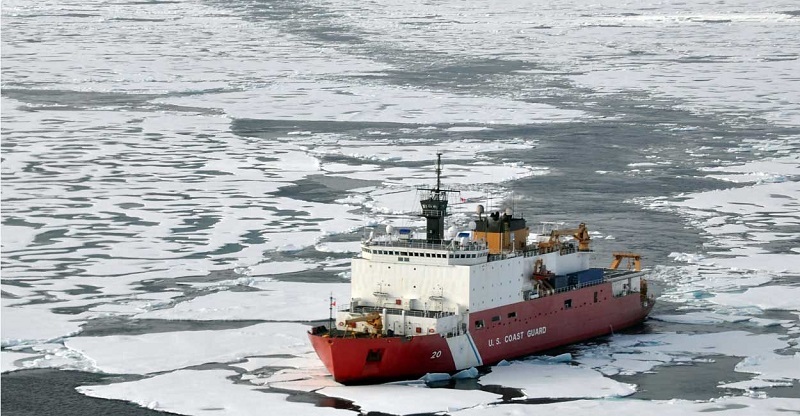 The U.S. has only one operational Arctic icebreaker, 41 year-old USCG Polar Star. U.S. political leaders and uniformed leaders in the U.S. Coast Guard make no secret of America’s capability gap in the Arctic. American elected officials are calling on increased funding from Congress, but new icebreakers are likely still a decade away . While the new Administration has not announced any Arctic initiatives, statements with respect to border security will require the exercise of capability along its northern frontier in terms of marine capability, domain awareness, increased capability of NORTHCOM (which encompasses the U.S. military’s involvement in the region) and development of maritime functions of NORAD, a joint U.S.-Canada command. The U.S. government has Arctic policy statements and directives from a wide range of military and civilian agencies “on file” to build on its infrastructure commitments in the region. Released in September 2016, the State Department International Security Advisory Board completed a comprehensive study of developments in U.S. Policy towards the Arctic, and provides a guidepost for American policy in the future. It makes many references to the Canada/ U.S. Arctic relationship. A change of administration in Washington means an opportunity to set new policy priorities, and prioritizing investment in the Arctic would be a smart step for the Trump administration. Doing so would reap significant benefits in terms of border security, rural economic growth, and international regional cooperation. President Trump will not forget his family’s business origins in the Arctic. Superimposed on this family connection, not to be underestimated is the underlying border security issue, and the need to protect American interests in a broad context through regional and bilateral cooperation. Given the increased international marine activity off Alaska’s northern frontier which stretches for 800 miles, much like Russia’s, the U.S. must arguably pay more attention to the region in coming years. The U.S. will now and likely in the future work on Arctic relationships from a variety of international agencies and forums such as the Arctic Coast Guard Forum (one such successful organization), and bilateral agreements with Canada, – for example with the status of the NW Passage. In that way, through a variety of approaches, America can ensure that its interests are protected in the short, medium and long-term. An America First policy will ensure that the United States will be planning, funding and developing critical infrastructure structure in the Arctic on a solid footing. This benefits the interests of all Arctic nations in a time of rapid climate change. Just as during the Cold War, the United States must continue to play a key role in the region to ensure stability. While the underlying causes of global change may be difficult to determine, climate change is evident and cannot be denied. It is not fake news. President Trump could well follow in his grandfather’s footsteps and vision. By showing Presidential leadership and seeing the Arctic as an economic opportunity for America and American interests, he could truly become the Arctic President of the 21st Century creating stability in the region. History often has a habit of repeating itself. K. Joseph Spears is the principal of Horseshoe Bay Marine Group and a longtime observer of U.S. and China Arctic policy since the early 1980s. He has been asked to participate by the Chief of Naval Operations on Arctic issues at the U.S. Navy’s War College. Joe can be reached at kjs@oceanlawcanada.com.